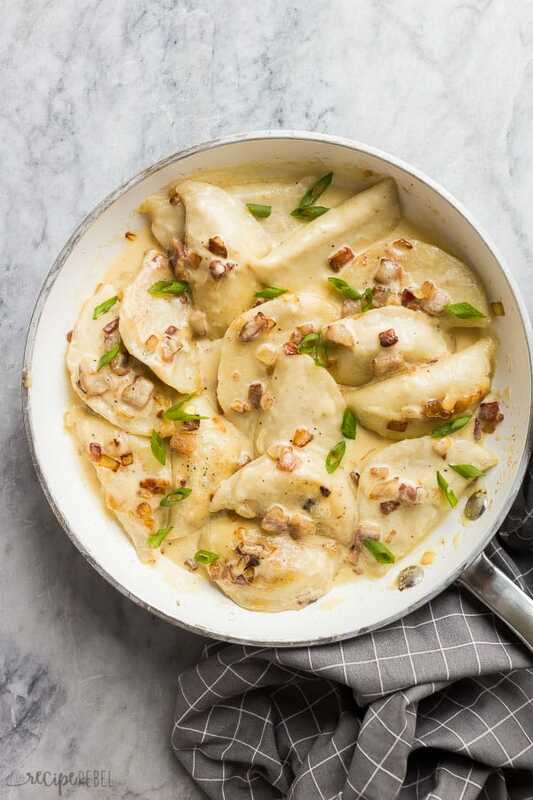 This Perogies Recipe with bacon and onions is crazy good — pure comfort food and perfect for a Christmas side dish! 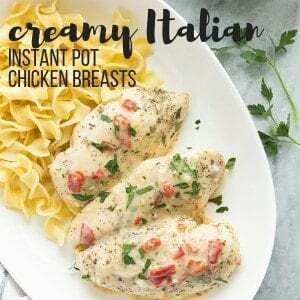 *I’ve added some updated photos since this recipe was published because the originals just didn’t show how ultra creamy they are! Call me a cheater, but today I’m not showing you how to make perogies (although I did that waaaaaay back here for these Saskatoon Perogies — my all-time, hands down favorite thing to eat ever). 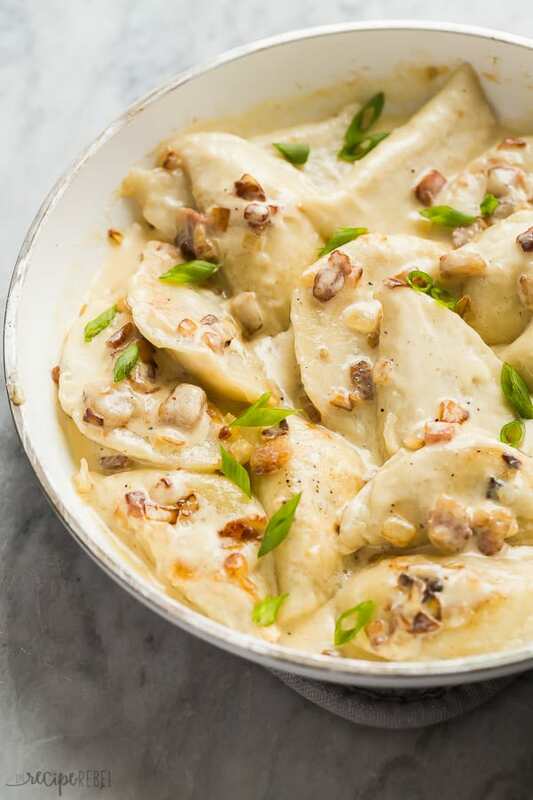 But I am going to show you one Ridiculously Delish way to cook perogies and serve them at your holiday dinners this month. I mean, regular old mashed potatoes are great ‘n’ all, but creamy potato and cheese stuffed perogies?!? It’s really the best of all of the worlds. Traditionally, we either had the store bought potato perogies or, for a really special occasion, my mom would make Vareneki or Vareniki or Wareniki filled with saskatoon berries and sugar and we ate them with a savory, salty, white gravy made from butter and cream. Vareniki and perogies (and pierogi) are all essentially the same thing, but one is Ukrainian and one is Polish and then there are all kinds of spellings and misspellings. I’m taking the easy way out here and calling them Perogies. In reality, you should get excited. Because comfort food has never been this comforting before. Now, there is a reason these are a treat and not an every day kind of thing. If you eat these every day or even every week and you have a heart attack, you don’t get to blame me. Make them for special occasions or for your Christmas side dish and the whole family will go nuts for them! When making perogies, it’s important that you invite all of your closest friends to join you. If you’re left alone with a pan of perogies in bacon and onions and cream, there’s no saying what might happen. You can’t put that one on me. Because I started with frozen perogies (around here, it’s easy to buy frozen, good quality perogies and not necessarily the mass-produced ones), I boil them first and then add them to the pan with the bacon. I know it’s an extra step and an extra pot, but it’s the holidays so the hubs will be around to wash the dishes anyway, right? You can absolutely mix things up and add some veggies to your pan — mushrooms would be great, or broccoli, brussels sprouts, green beans…. there are lots of ways to round out this decadent meal. I think boiling is the best way to cook frozen perogies — it takes just a few minutes, and they pop right to the top of the water when they’re ready so there’s no second guessing. 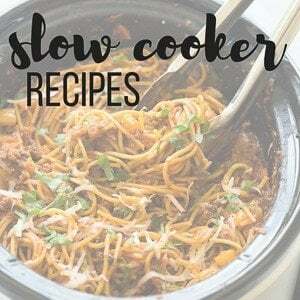 You can also add frozen perogies to casseroles and simmer in one pan recipes, but it’s more difficult to get right because it’s tough to know how much water they will release as they cook and may water down sauces or not cook completely. I would not add them directly to a hot dry pan without a considerable amount of liquid. Serve with a salad, steamed veggies, or even frozen if you’re feeling the need to bump up the nutritional value. We always add them with cream gravy — but not really necessary with this recipe! Some people enjoy sour cream with perogies, if you’re into that sort of thing. This Perogies Recipe with bacon and onions is crazy good -- pure comfort food and perfect for a Christmas side dish! Bring a large pot of lightly salted water to a boil. Add frozen perogies and boil for about 3 minutes or until they float to the top. Meanwhile, cook bacon and onion in a large skillet until both are lightly browned. Remove cooked perogies to a plate lined with paper towel. 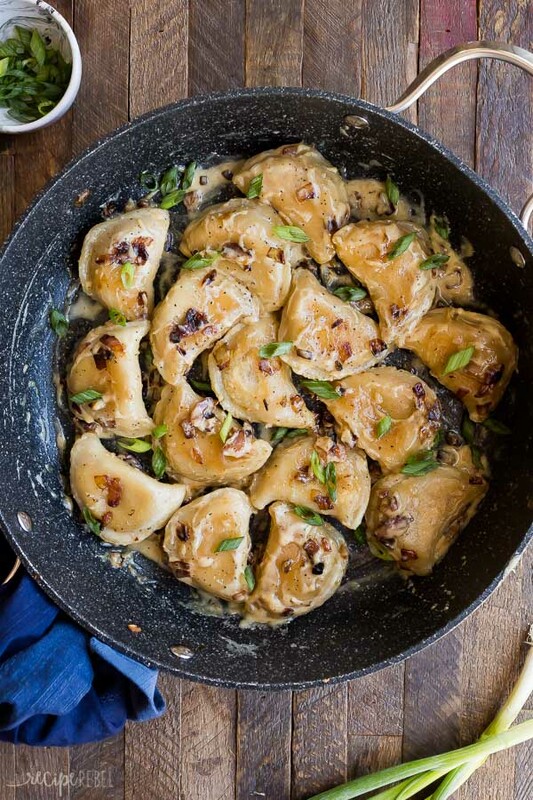 Add butter to skillet with bacon and onions, then add perogies in a single layer and brown on both sides, about 3 minutes per side. Whisk together cream, salt and pepper and add to the hot pan once perogies are lightly browned. Let simmer for 2-3 minutes until thickened slightly (it will bubble up and thicken fairly quickly, so keep an eye on it!). Remove from the heat to garnish with green onions if desired and serve. It has been way too long since I have had pierogis!!! I can’t wait to try these! I love me some peirogies soooooo much! I can’t wait to try this spin! 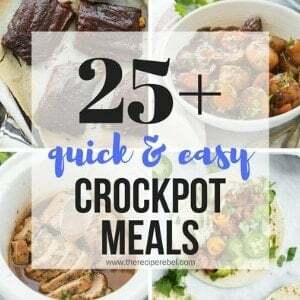 I am loving this easy dinner idea! Bacon is perfect with pierogies! 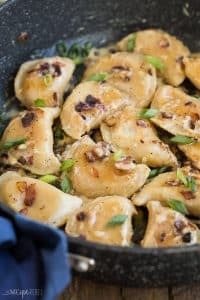 I love new things to do with Pierogies and this is one my family loves! Oh these sound heavenly! I love pierogies, yes even the frozen kind, and who doesnt love bacon? Combined these just might even make my husband happy. I must make these asap! Thank you! Thanks Marissa! I hope you enjoy them! 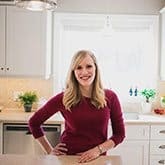 They are one of my favorite comfort foods too!